Florida is a perfect location raise olive trees--the ancient Mediterranean delight. 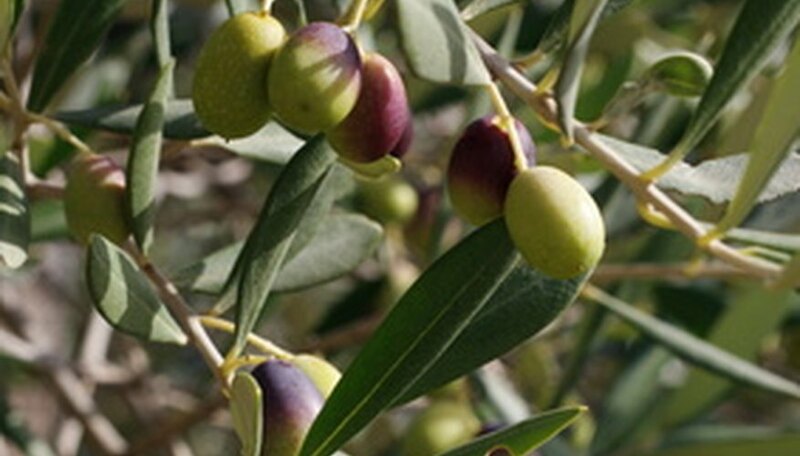 There are some olive varieties regarded as native to the Floridian area. Average temperatures rarely fall below 55 degrees Fahrenheit in the sunshine state, an environmental attraction that makes Florida one of the few warmest destinations in the continental United States--and ideal conditions for growing olive trees. Black olive trees grow in the fall through spring seasons, reaching up to 50 feet in height and having a 50-foot-wide spread. Its yellow flowers bloom in the spring, and its olive fruit develop in the summer. The hard fruit of this olive tree are not edible for humans. Black olive trees are highly drought-tolerant and grow in full sun to partial shade. In the southernmost part of Florida is where the Madagascar olive tree grows. A non-native perennial tree, the Madagascar olive (Noronhia emarginata) belongs to the Oleaceae, or olive, family. This olive tree grows up to 20 feet high and with a 20-foot-wide spread. The tree produces fragrant yellow blossoms followed by yellow, green or purple edible fruit that are less than one inch in size. The Madagascar olive tree is a very hardy tree that thrives in low-moisture conditions and resists most diseases and pests. Thorny olive (Elaeagnus pungens) is a non-native perennial evergreen shrub that belongs to the Elaeagnaceae, or oleaster, family. It is also known as thorny elaeagnus, silverthorn and spotted elaeagnus. Thorny olive grows in Florida, throughout the southeastern region of the United States and even in Washington D.C. and Massachusetts, according to the United States Department of Agriculture. Thorny olive grows up to 15 feet high and 20 feet wide. Its cream-colored flowers bloom in the fall through winter seasons followed by the production of its small maroon-colored fruit that is edible by both humans and animals. The fruit are very tart in taste, according to Floridata. Russian Olive (Elaeagnus angustifolia) is a non-native tree that grows in the northwest part of Florida. It belongs to the Elaeagnaceae, or oleaster, family and is a perennial tree that reaches up to 35 feet at mature height. Russian olive grows in the spring and summer seasons. Its white to yellow flowers bloom in the early summer, and its small, edible yellow fruit develop in the summer. Russian olive grows in full sun exposure, it thrives in well-drained soils and it has a high tolerance for drought conditions.